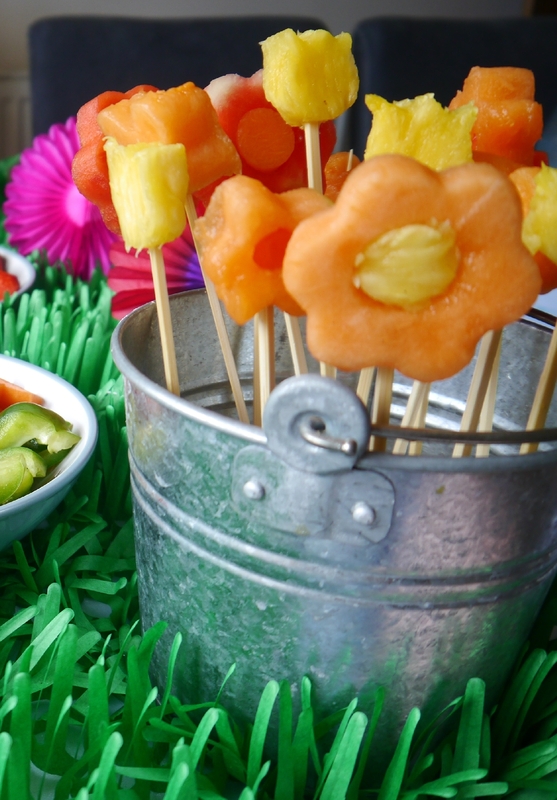 One easy and healthy snack that I put out for my kids parties are fruit pops in buckets. I got mine from a craft shop but you could also use Easter egg buckets or flower pots. Buy a sphere of flower arranging foam for each container, making sure it fits inside. You can keep the foam and use multiple times until it has too many holes at which point just buy a new one. Once you have your bucket and foam all you need is some wooden food skewers and the fruit itself. I use pineapple, canteloupe and watermelon but you could also use honeydew melon or any fruit that can be sliced and then cut with cookie cutters into shapes. This idea also works well with cheese. A quick, easy and healthy snack for parties. Cut Shapes from your chosen fruit. If making daisies cut circles from the middle and put in a circle of contrasting coloured fruit. Push carefully onto the wooden skewers. Carefully push the skewers into the floral foam in the display bucket.